Luther King House B&B is within very easy reach of central Manchester. The city has an excellent array of restaurants, bars, coffee shops, museums and galleries, along with shopping to suit any style, from high-end Harvey Nicks to the bohemian Afflecks Palace. The Northern Quarter, Spinningfields and Chinatown are good bets if you like to wander along the street sniffing out a great place to eat, but there are many tucked away across the city and in the suburbs. They can be hard to find on your own, so we love Onionring for its funny-but-fair restaurant reviews, and latest special offers. There's plenty of entertainment, with great live music performed almost daily in venues as diverse as Manchester Cathedral, Matt & Phreds Jazz Club, and Band on the Wall, along with clubs and classes where you can salsa, strut or dad-dance the night away. Experiences such as the Coronation Street tour, Manchester United Museum & Tour and the Man City Matchday Stadium Tour offer a taste of the city's fame & fortune. For those who enjoy a challenge, there are several top notch escape-the-room puzzles and themed crazy golf courses across the city! Or if you'd like to burn off some energy, try indoor skiing at Chill Factore, perhaps a spot of bouldering at the Manchester Climbing Centre, or head out for a hike in the Peak District National Park. Manchester is easy to get around - most of the city centre can be explored on foot, with a good network of trams, trains (this is a good journey planner), and even water taxis to ferry you further afield. The city offers good value compared to many â€‹weekend breaks in Europe, and many of its attractions will cost you nothing. Several of its most iconic sights are free to enter. Here are five of our favourite free places to visit in & around Manchester. If you're not staying long enough to go out on the town, you might enjoy a lunchtime stroll (or jog, kick-around, or kite-flying!) at Platts Fields, the large Edwardian Park at the end of our road. Cared for by community volunteers, the park features tennis & basketball courts, football pitches, landscaped gardens, a boating lake and a well-equipped kids' playground. It's also home to some interesting birdlife, including tufted ducks and parakeets! Walk for 20 minutes up the Wilmslow Road and you'll find the Whitworth Gallery, one of the Tate's northern outposts. It's set within a relaxing wooded park, and has a nice terrace restaurant where you can chew over your opinion of the gallery's latest exhibits. Manchester Academy and the Royal Northern College of Music are 25-30 minutes walk or a quick taxi ride away, so we're the perfect place to come home to after a late-finishing concert. 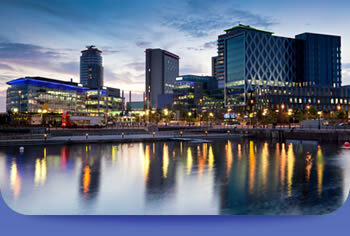 The B&B is also close to Manchester Royal Infirmary, St Mary's Hospital and Manchester University. The journey is direct and easy - 10-15 minutes on the bus, or 20-25 on foot, straight up Wilmslow Road towards central Manchester, so you'll be conveniently placed to visit loved ones or attend a graduation.